Upgrading your backyard means increasing both its visual appeal, as well as its function. Here are some easy ways to do just that! A deck is an easy and relatively inexpensive way to increase the usage of your backyard. A deck can be so many things, from a space to read a book, to a place for entertaining and even an outdoor dining room. Read our Decking Design Ideas, and Wood Choice blogs for inspiration in your deck building. If you already have a deck, you’ll be amazed by how much better your whole backyard will look if you do a bit of repair work on your existing deck. Whether it’s replacing broken slats, or just applying a coat of varnish, you can basically enjoy a whole new deck within just a couple of hours. Now is a great time to do this, as it will get your deck ready for the busiest time of the year. Just make sure you check the weather report because you need a couple of dry days to effectively stain your deck. A patio or pergola is an excellent option for any backyard. Like a deck, they increase usability but are a little broader in what you can do with them. 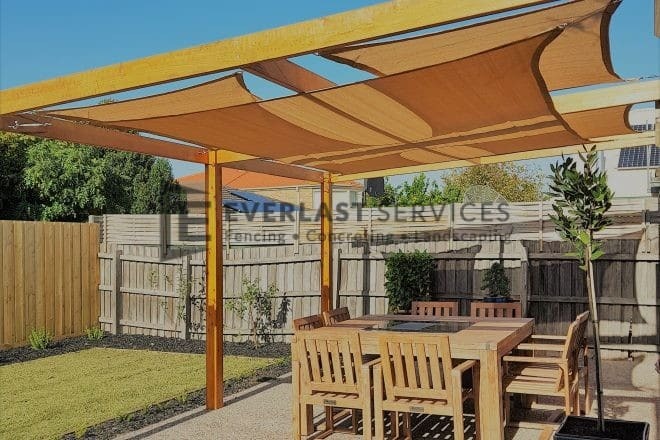 A pergola naturally turns your backyard into a space you can use 365-days a year, team it with an outdoor kitchen, and you’ve got something that will add value to your home and your life. A patio gives you a beautiful courtyard to organise the rest of your backyard around. Fill it with potted plants, chuck a barbecue in there and get some beautiful outdoor furniture and you’ve got an alfresco eating space. Garden beds are the ultimate function and design combo. They help to organise your garden and assist in creating the lines and division that make a garden visually interesting. On top of that, they also make gardening far more manageable, by reducing weeding needs and allowing you to create more fertile soil for particular plants to be planted in. For even easier gardening, plant C- or U-shaped beds. These are known as keyhole gardens, and they make it easy to garden because you can pivot while working and they’re also easy to modify based on changing tastes. Your backyard should be your oasis. An escape from the pressures of the world, and a place for you to connect with the natural elements. This is a bit hard to do if you can see your next-door neighbour mowing the lawns in his undies. Privacy screens are an inexpensive way to block out the world. They also giving you some room to move in terms of your garden, as privacy screens are the perfect scaffolding for creepers and other forms of vertical gardening. With so many materials to choose from, your privacy screens can suit any design scheme. Timber for a traditional look, or go steel for something a little edgier and industrial. Every backyard with enough space should have a veggie patch. We are placing so much stress on our natural environment. As such, any bit of food you can grow yourself makes an enormous difference. They are quick and easy to build, and Melbourne has a great climate for producing everything from broccoli to strawberries and even passionfruit. You really just need some old railways sleepers, a shovel and some good quality soil to get started. Then, just head down to your local nursery. Ask for some advice on what will grow best. If you’ve got young children, they’ll love getting their hands dirty and watching those little seeds turn into food. The best part is, you’ll get to fill their plates with fresh, nutritious food for free! Everyone loves water features. The sound of running water has been used in therapeutic settings forever, and who doesn’t need a little therapy in their backyard. It’s best to get a professional to install one, as they can be a bit tricky. And, if not done right, you can create an electrical hazard. Perhaps the best part of a water feature is the new wildlife you’ll attract. All sorts of birds, bugs and lizards will come running for your garden oasis, and don’t we all have a little room for some new friends in life?